2008 – First Irish expedition arrives at South Pole. Team leader Pat Falvey and Clare O’Leary, Sean Menzies and Jonathan Bradshaw, journeyed for 58 days to reach their destination. Dr O’Leary is the first Irish woman to make the trip. She is also the first Irish woman to climb Mount Everest. 100 years after Shackleton’s Terra Nova expedition to Antarctica, a team of four Irish explorers have become the first all-Irish expedition to reach the South Pole. The Irish Polar Expedition had to trek 1,100km during 58 days through extremely harsh Antarctic snowstorms and iced gale winds, while pulling sledges weighing 150kg. 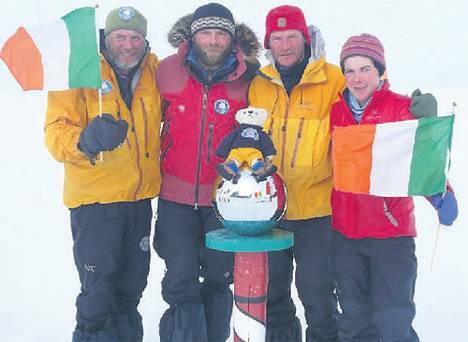 Irish adventurers Pat Falvey, Clare O’Leary, Shaun Menzies, Jonathon Bradshaw, and mascot Freddy the Teddy Bear made history last 08 January 2008 as the the first all-Irish expedition to have ever reached the South Pole. The “Beyond Endurance” expedition was organised to commemorate the 100 anniversary of the famous journey to Antarctica of Irish explorers Ernest Shackleton and Tom Crean, who attempted to reach the pole in 1908 but had to give up with just 180km to go because of shortage of food supplies. The Irish team was lead by world-renowned adventurer and Everest climber Pat Falvey (50), and the expedition’s deputy team leader was Clare O’Leary (35), the first Irish woman to have climbed Mount Everest and the first Irish woman to have reached the Seven Summits (the highest mountain on each of the seven continents). The “Beyond Endurance” expedition followed the footsteps of Shackleton and Crean, who had arrived to Antarctica on the HMS Endurance as part of the legendary Terra Nova expedition. Falvey, O’Leary, Menzies and Bradshaw had to trek 1,100km during 58 days through extremely harsh Antarctic snowstorms and iced gale winds, while pulling sledges weighing 150kg. Expedition leader Pat Falvey admitted that this was the hardest expedition he had ever had in his life. Speaking by satellite phone from Antarctica, he said “We had 14 days of white out where we could see nothing in front of us”. Weather conditions were so severe that they often could not make the planned amount of daily progress towards the South Pole. When the team reached the US South Pole Research Station, they only had just one day’s food rations left. The “Beyond Endurance” became the first all-Irish expedition to have ever reached the South Pole, although the first Irishman to have been on the South Pole was adventurer Mike Barry, who planted the Irish flag on the 21st January 2004 as part of an international expedition. Irish President Mary McAleese and Taoiseach Bertie Ahern sent their congratulations to the “Beyond Endurance” team shortly after the party reached the South Pole. “You are continuing a proud tradition of Irish adventurers and you should be very proud of your wonderful achievement”, told the Taoiseach. 1979 – The tanker Betelgeuse explodes in Bantry Bay, Co. Cork. Today in Irish History: 9 January _________________.